Product Ventures embarked on this creative design journey to decode the historical meaning of this misunderstood spirit and to translate its rich narrative into compelling packaging concepts. Immerse yourself in Absinthe's captivating story and experience the holistic collaboration of graphics and structural package design. Journey with us as we uncover the true story behind one of the world’s most notorious and misunderstood spirits. Mortier & Pilon embraces the apothecarian and herbal heritage of the absinthe spirit. The frosted glass and soft celadon color palette paired with silver adornment creates a premium and yet approachable aesthetic. Its shorter chalice-like proportion and cork-like stopper helps to communicate the preciousness of the elixir within and the additional graphic filigree abstractly emphasizes the natural quality of the product. Holistically, this package depicts the often misunderstood spirit of absinthe in a much more favorable and homeopathic light, extending its relevance to a broader target. Sarabithia Absinthe is the embodiment of graphic and structural mediums working holistically to communicate the rich and mystical allure of Absinthe. The vine-like form of its plated cast metal necklace is suggestive of its natural roots while the arched indentation above the label connotes a portal to another world and provides a non-slip detail for enhanced handling. The graphic panel’s deep and dark elements speak to fantasy and wonderment while the sitting fairy’s coaxing gaze allures all those who pass by. The blown-glass stopper provides an ergonomic grip for cork removal and is reminiscent of the seal on a potion or elixir. 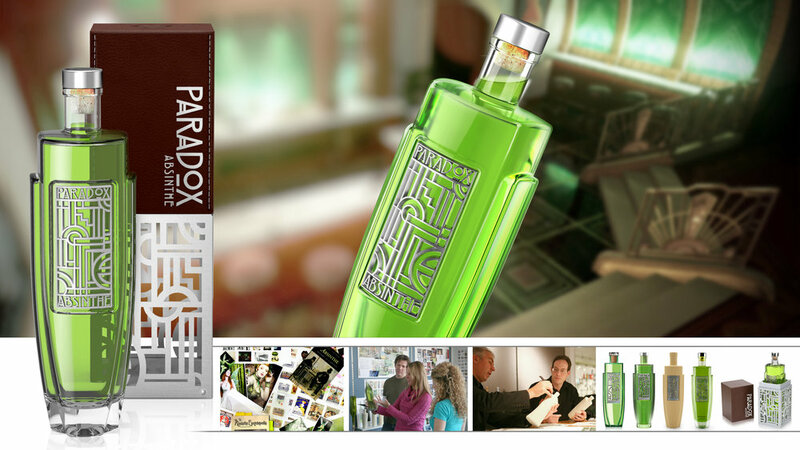 Paradox Absinthe is inspired by the Art Deco Architecture and Speakeasies of the 20s which are expressed both in the overall structure of the bottle as well as in the geometric pattern of the central panel. The graphics are 3D in nature and are embodied by a metalized inlay that brings further textural definition to the holistic form, a beacon of structural and graphic harmonization. The bottle is weighted high to evoke exclusivity and confidence as well as mirror the higher level of awareness and sensory experience often connected with the spirit of Absinthe. The positive and negative space, along with the reflective quality of the chrome inlay, provide a feast for the eyes that gets more decadent with each and every glance. L’Or (or “the gold” in French) embraces the privilege and desirability that so often accompanies the world of alcoholic spirits. Taking its cues from prohibition speakeasies and the Art Deco design style, L’Or evokes a strong and confident structural design language with added flair in its marquee-like terracing. The graphics further enhance the prominence suggested by the structure with its gold foil label that is reminiscent of an exclusive address. The 140 in this instance is meant to reflect the proof of the spirit which allows it to command such a high price point and therefore appeal to a more privileged clientele. As a whole, L’Or’s stature and aesthetic justifies its presence on even the most discerning aficionado’s shelf. Enchant embraces absinthe’s more expressive and playful side with an aesthetic that entices its audience to touch and explore. The structural design draws inspiration from the fractal and visually intoxicating design language of a kaleidoscope with the crystalline variations in the form enchanting the eye as they catch the light. The gold closure with green crystal top adds a deliberate element of overstatement to nod to the embellishment of the tale of absinthe itself. The simple orange band plays beautifully off of the green tinted glass and, paired with the gold hot stamped brand mark, adds just the right touch of exuberance tempered by restrained sophistication.